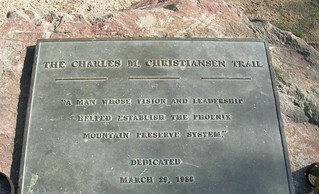 Charles M. Christiansen provided the vision and leadership in establishing the Phoenix Mountain Preserve trail system so that we can all enjoy this treasure in the middle of Phoenix. Piestewa Peak may be the crown, but The Christiansen Trail is the heart of & soul of the preserve. Those of us who hike, bike or ride horses in the Preserve, should pause every now & then and give thanks to those who made this all possible.